Narkanda owes its initial importance to the construction of the Hindustan Tibet Road. Originally styled ‘The Great Hindustan Tibet Road’, this road connected the Gangetic plains from the town of Kalka to the Tibetan border. It was Governor-General of India, Lord Dalhousie (1848-1856) who ordered work to begin on this in June 1850. Various reasons are cited for the initiation of the road. The system of ‘begari’ prevalent in the hills, where unpaid laborers were pressed into service – including for the transport of timber and files to Shimla – is said to have upset the Governor-General so deeply that he wanted to improve the track these men trudged. It is also believed that Lord Dalhousie wanted to create trade ties with Tibet – and this felt to be the real reason for building the road. 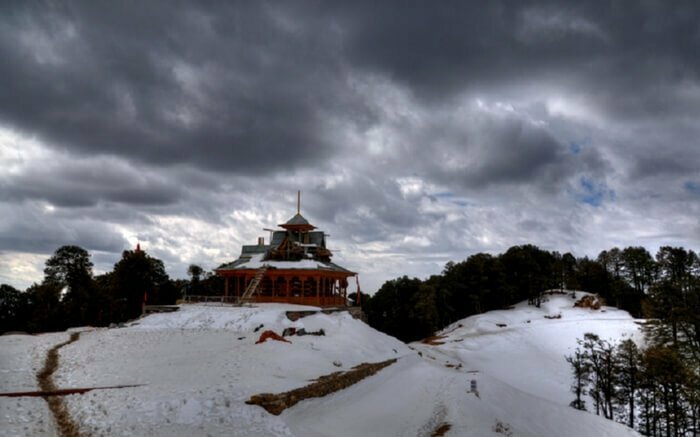 Narkanda was an important staging post on this road and was the highest point between Shimla and the valley of the river Satluj. From this point on, till it began rising again for the final leg, the road was largely downhill. The second impetus of growth came in the first half of the twentieth century, when apple product began in Kotgarh-Thanedar belt a few kilometers from Narkanda. The peak of Hatu (Hattu), above Narkanda, is amongst the highest in the mid-Himalaya. These heights mark the line before the hillside moves down to the valley of the Satluj River. The peak can be accessed by a narrow motorable road from Narkanda which is functional during the summer months. Alternatively, there is an 8 kilometer hike trail that passes through dense woods of cedar, spruce and oak; if you are a good walker, this is a far better option as it will unfold vistas that remain screened by windshields. The view from Hatu is absolutely breathtaking. Below lies the river valley and the hillside that reaches down, is covered with thick forests, little villages, apple orchards and terraced fields. Across, is the magnificent spread of the greater Himalaya with a permanent cover of snow; the Kinner Kailash (one of the legendary abodes of Lord Shiva), the Shrikhand and the Kullu ranges are all clearly visible from here. The temple of Hateshwari Mata of Hatu Peak is dedicated to a local embodiment of Devi Durga. From Narkanda one can visit Thanedar and Kotgarh. Harmony Hall at Thanedar is not exactly what one would expect to find in a little village in the Himalaya, howsoever prosperous. It stands on top of a hill, surrounded by apple orchards. It is an unusual piece of architecture that draws from the local style of interlocking horizontal wooden beams packed with dressed stone, and is combined with elements of the ‘western’ architectural experience – high chimney-stacks and large windows. It also speaks worlds for Satyanand Stokes, the man who built it – a man who came from an entirely different background and made this house in what was then a ‘back-of-the-beyond’ in the hills. Stokes left an indelible mark on the lives of the people with whome he lived. The contiguous settlements of Thanedar and Kotgarh form the core of Himachal’s apple – growing heartland. This pocket of charming mountain countryside is also reputed to have amongst the highest per capita incomes in South-east Asia. And all this prosperity is due to stokes, who introduced the American varieties of apple in the area and modern systems of marketing and packing. Apples apart, soon after the repressive Rowlatt Acts were passed in 1919, stokes became an active associate of Mahatma Gandhi and was even jailed for his role in India’s struggle for freedom. The setting of Kotgarh predates stokes and this was a tract where many fled to escape from local oppressors. Then some two centuries ago, during the ‘Gurkha Wars’ that the British first came to this area. The little wooden church of St. Mary at Kotgarh predates the apples. A school was established here in 1843 and the church built in 1872; this was run by the Moravian missionaries and the Church Missionary Society. 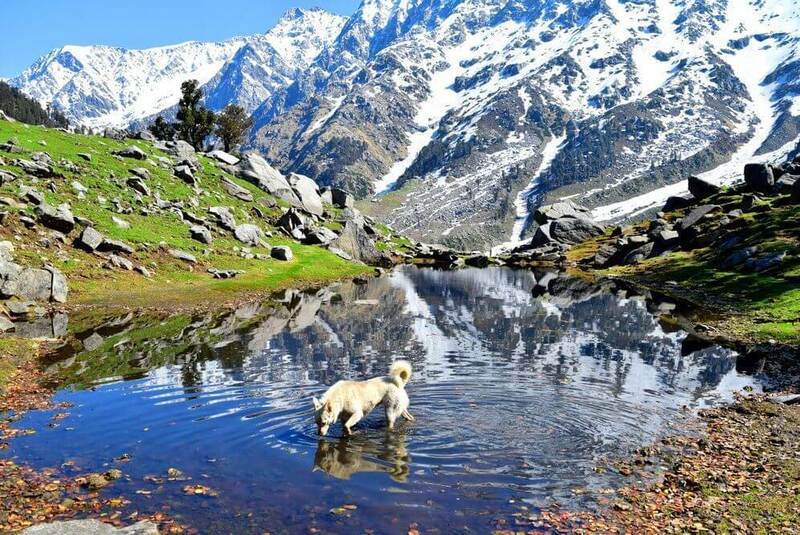 While this may be what more recent times have given the area, apart from the forests and magnificent views that hold the deep valley and the snow-ranges, nature has given Kotgarh a small lake, Tani Jubbar and by its side is a small temple built of wood and slate. This is the site of a local fair held at the end of May. Substantially populated by Brahmins, the village of Nirmand lies across the valley of the river Satluj and is the largest village in Himachal. The word ‘Nirmand’ is regarded as a derivative of ‘Nir – mund’, or without a head and is closely connected with the legend of Parashurama, who is regarded as the sixth incarnation of Lord Vishnu – and is the one just before Ram. Parashurama was one of the ten sons of the sage Jamadagni and his wife Renuka. One day the sage was beset with doubts about his wife’s fidelity and commanded Parashurama to kill her. Nirmand has also been a major centre of the ‘bhunda’, human sacrifices as it once existed in the hills. From the banks of the Satluj, the road to Nirmand rises in zigzag snips. The first section is through bare rock and scraggy bushes. These weaves of tarmac hold the training camp of one the few mountain batteries that still uses pack animals. One of the oldest records from the hills of Himachal comes in the shape of what is called the ‘Nirmand Copper Plate’. This plate records a land grant dated to the seventh century. Narrow streets wind their way through the few acres that form the core of this village that may well have been inhabited for a millennium and a half. The path to the Kothi of Parashurama slices through the heart of the village. En route lies the sacred ‘Latta Baoli’ whee clear spring water gushes into a small tank. Then is the tiny – but remarkably elegant – temple of Shiva that is barely the height of a child but has perfectly classical proportions. The temple of Parashurama has a pent-roof and age-old lines of wood and intricate carvings make its façade. Here lies the mythical axes of Parashurama and several other items of dress and armour that are attributed to him – and are only take out their cave at the time of a bhunda – which is still held as ritual every few years.